Caesar salad is easy to overlook as it’s become so commonplace. This vegetarian version is decadent and hearty, worthy of dinner all on its own–not just the first course. Making any salad dressing from scratch, with or without a recipe, is easy once you learn how to balance flavors. Identify the overwhelming or missing component and find its counterbalance. Balance bitterness by adding salt or sugar. Counteract blandness by adding more of the strong flavors such as lemon, garlic or capers. If it’s too heavy, use herbs to lighten. If it’s too light, add richness with more Parmesan or green olives. Use black pepper or more olive oil to balance sweet or salty. 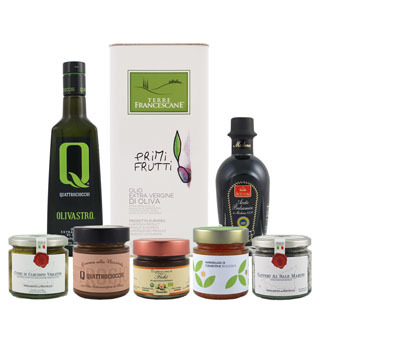 Gradassi Centenaria olive oil is a beautiful brilliant green with golden hues. Its bouquet reveals a harmonious balance of bitter and fruity sensations, culminating in an explosion of artichoke. 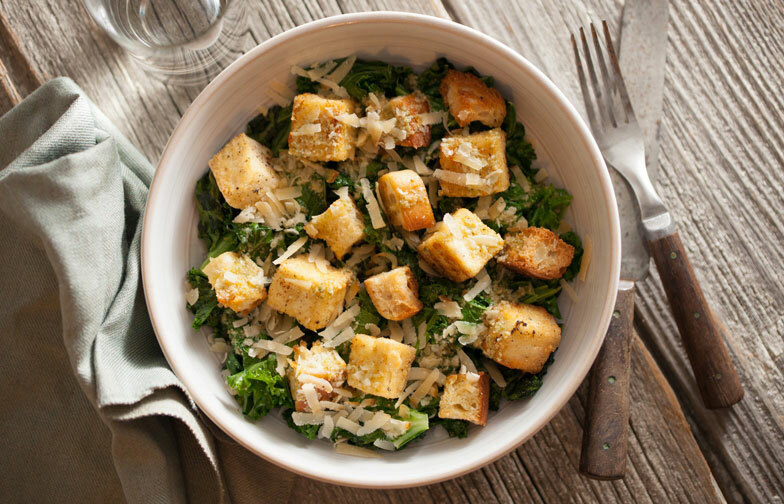 The boldness is balanced with the strong flavors and textures of the Kale Caesar. With an emersion blender, thoroughly blend all dressing ingredients. Taste and add ingredients as needed. Refrigerate. Heat oven to 400°F. Spread cubed bread onto a baking sheet. Drizzle with olive oil and sprinkle with salt. Lightly toss, then shake to evenly distribute. Place in oven for 10 minutes or until golden brown. In a shallow bowl combine cornstarch, ¼ cup grated Parmesan, ½ tsp salt, and 1 tsp black pepper. With your hands, dunk and coat all sides of each piece of tofu in the cornstarch mixture. Place coated tofu on a plate until ready to fry. In a deep frying pan, heat 1 cup olive oil on medium-high. When you think it might be hot enough, place a piece of into the oil. It should sizzle immediately. If it’s smoking, turn the heat down. If it doesn’t sizzle, wait a little longer or turn up the heat. Individually place pieces of tofu into the hot oil, leaving room to flip with tongs or a metal spatula. Fry each side, about 1 minute each, until a light golden brown. Remove from oil and set on a paper towel to drain and cool. When all tofu is done frying, carefully remove excess oil from pan (placing in a heatproof dish), leaving the pan coated but not pooling oil. Drop a handful of kale into the pan. Let sauté uncovered until wilted, then continue adding more kale until all the kale is wilted, adding more oil back in as needed to prevent burning. Plate in individual bowls, layering the sautéed kale, fried tofu, croutons, dressing and shredded Parmesan. Serve immediately.